SG 135 Wireless Rev.3 HW Appliance with 8 GE ports, HDD, integrated AP + Base License for unlimited users + power cable. The Sophos SG Series appliances are designed to provide the optimal balance between performance and protection - for diverse IT environments. Whether you need a solution for a small remote office, want to protect your school campus, or are a global organization requiring high-availability and enterprise-grade features, our SG Series appliances are an ideal fit. Our broad product line-up makes it easy for you to choose the right appliance. A higher model number indicates higher throughput and an increased number of ports or connectivity options. Using the latest Intel technology, our products provide the utmost in flexibility. Add to your protection as you need it - without changing or upgrading your hardware. That means you benefit from future software and performance enhancements which guarantees the best possible value for money. Redundancy features such as an additional hard-drive or power supply are available on the 1U SG 450 and on both of our 2U appliances. Configure your hardware to suit your infrastructure and change it as and when you need to. Our optional FleXi Port LAN modules give you the freedom to select the connectivity you need - copper, fiber, 10GbE - you decide. FleXi Port modules are interchangeable within a range, e.g. 1U, so, for example, you can use the same module with all of your 1U appliances which saves you money if you upgrade to a higher model at a later date. Every one of our appliances has a built-in wireless controller for you to connect Sophos access points and manage them simply from your central management console. Most Sophos customers choose our Total Protect bundles. They give you everything you need to secure your organization in one easy-to-manage license: an SG appliance, a FullGuard subscription, and your technical support. FullGuard combines all our core licenses in one cost-effective subscription for complete security: Essential Firewall, Network Protection, Web Protection, Email Protection, Wireless Protection and Web Server Protection. 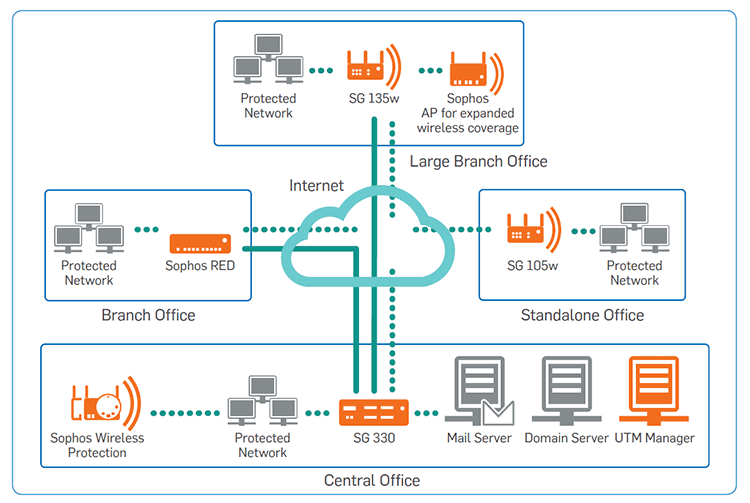 Sophos RED: Simply secure your branch offices by forwarding all traffic to the central Sophos UTM. Installation requires no technical training and there is no ongoing maintenance. 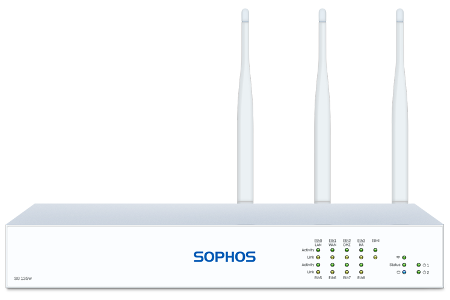 Sophos WiFi Access Points: Configurationless access points are instantly protected by the UTM, letting you create secure networks for your employees or guest hotspots for your visitors. VPN Clients: Secure SSL or IPsec VPNs provide mobile and home workers with secure remote access from any location at any time. Free UTM Manager: Centrally manage multiple UTM devices through IPsec VPN tunnels; deploy policies in just a few clicks. Download the Sophos SG Series Data Sheet (PDF). SG 135w HW Wireless Appliance with 8 GE ports, HDD, integrated AP + Base License for unlimited users + power cable. *For new purchases only. AP warranty is not included for the SG Wireless Subscriptions and will need to be purchased separately. *AP warranty is not included for the SG Wireless Subscriptions and will need to be purchased separately.